Disney PIXAR Monsters University Now On Blu-Ray 3D! You are here: Home / Things We Use Reviews / Apps Movies Games Books / Disney PIXAR Monsters University Now On Blu-Ray 3D! The Disney PIXAR Monster crew is back in Monsters University this scary and fun tale of Mike Wazowski (voice of Billy Crystal) and James P. Sullivan, “Sulley” (John Goodman) before their Scaring careers. This is their story of how they met at Monsters University, MU. They met but right away during their first semester at MU, Mike is taken off course after he meets Sully. They instantly become competitive friends who’s antics and out-of-control behavior gets them kicked out of the elite Scare Program. To make things right, Mike and Sulley team up with a bunch of misfit monsters with which they have to cooperate and work with to get themselves out of the trouble they began. This is a great story of how growing up and becoming an adult helps one discover some things while growing up. And of course all sets include some great bonus materials. Some of the short clips include Campus Life, Story School, Scare Games, Music Appreciation, Color and Lighting, Deleted Scenes, a short film “The Blue Umbrella,” and more! Check out this great video of a Mike Wazowski Pumpkin being carved in a time lapse video. Try it out yourself! QUESTION – What is the name of Mike’s elementary school? QUESTION 2 – Who is the last monster off the school bus at the start of the movie? QUESTION 3 – What is the name of Mike Wazowski’s carpooling cousin? QUESTION 4 – Susan is the name of Mike’s schoolteacher. True or false? QUESTION 5 – What’s the first item on Mike’s university list? QUESTION 6 – How many suitcases does Mike take to university? QUESTION 7 – What is the name of the student who leads the orientation tour around the Monsters University campus? 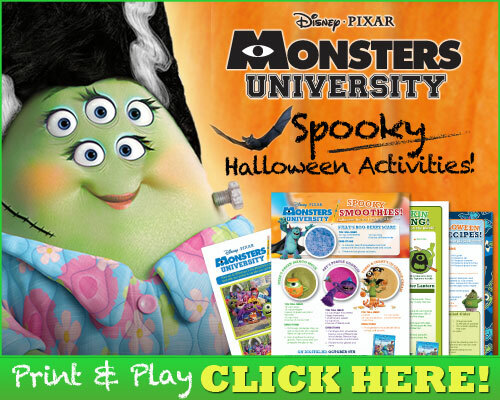 QUESTION 8 – Which school is the ‘crowning jewel’ of Monsters University? QUESTION 9 – Which council sponsors the annual Scare Games? QUESTION 10 – What is the number of Mike’s dorm room? This was a cute movie. My 15 year and I saw the movie and we both enjoyed it.